Flowering: April-June. Biennial or perennial. Native. 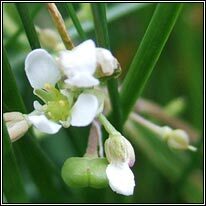 White flowers, 4-petalled, petals 5-6mm. Flattened fruit. 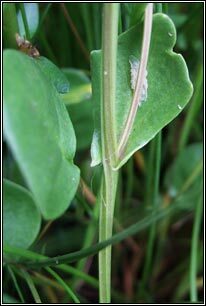 Stem leaves stalked or clasping. Basal leaves tapering to stem. Stems erect or ascending. To 35cm. Salt-marshes, also on firm mud near high-tide mark. Scattered coastal distribution, but mainly South. Not on roadsides. 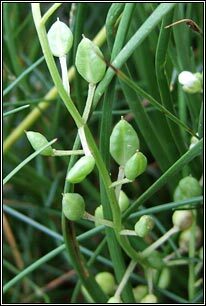 Less frequent than Common Scurvygrass. 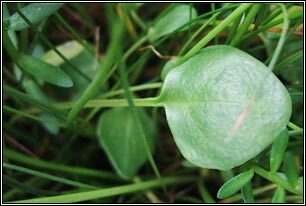 Similar: Common Scurvygrass, C. officinalis.